Exterior perimeter security is paramount for the protection of critical infrastructure. The first line is usually a wire fence with warning signs around the entire area of a guarded site. This is done to prevent accidental non-malicious trespassers from entering the area. Inside this fenced area, and significantly closer to the guarded structures, there’s the second fence, which is set up to stop the trespasser and also to raise an intrusion alarm. This fence is equipped with intrusion sensors, and, in certain cases, can be electrified with high-voltage current supplied to its current-carrying surfaces. 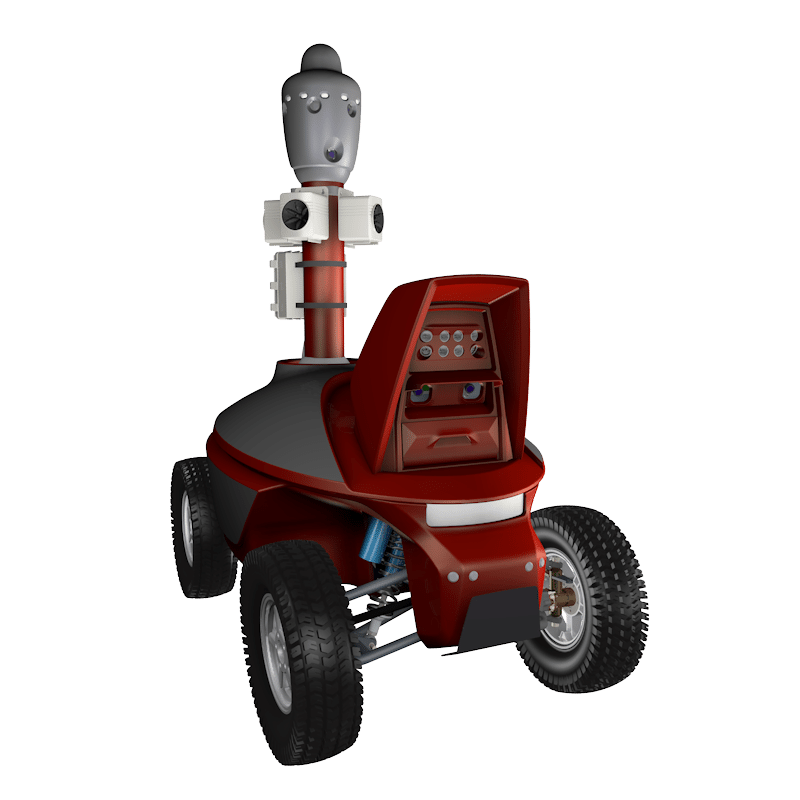 The S5 PTZ Security Robot is designed for area surveillance between the first and second fences, and it ensures long-range surveillance. Located on the inner perimeter away from the outer fence, the robot watches over much of the area. In case of movement detection, the robot aims its PTZ camera at the moving object, zooms in on it, and transmits its image to the CMS (central monitoring station). The S5 PTZ Solar Robot is equipped with solar panels intended for a prolonged service in sunny territories without recharge. S5 Perimeter Control Robots patrol the inner side of the second fence. 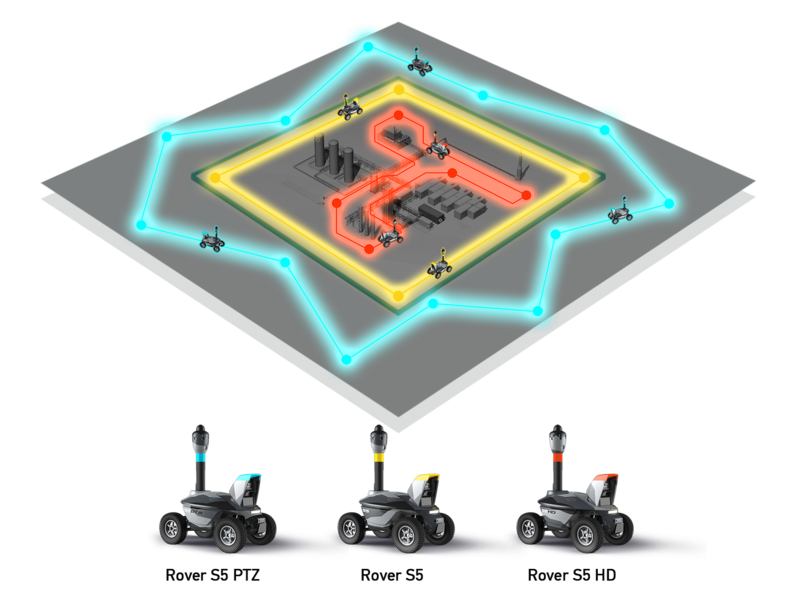 The purpose of these robots is to continually move along the fence and monitor the territory at a medium distance, thus giving the intruder no chance to penetrate the fence and bypass the intrusion sensors. If the sensors are activated, the perimeter control robot diverts from its route and heads for the suspected intrusion area. 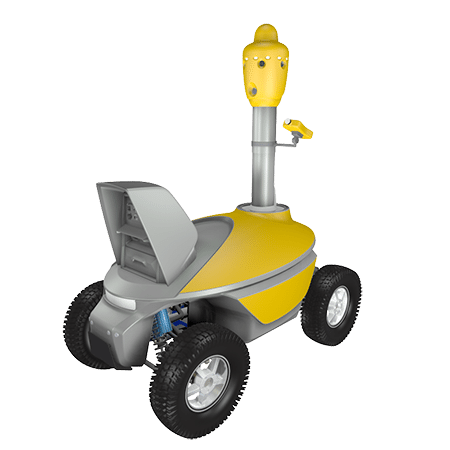 The S5 HD restricted-area patrolling robot is designed for patrolling the secured area rather than its perimeters. The location of the equipment and the facilities of the critical infrastructure is a vital area and requires strong surveillance, due to the abundance of places where an intruder can hide after entering the site by ways other than negotiating the perimeter fence. These include, for example, hiding in the back of a truck and entering the secured area through the check point. The S5 HD Robot can quickly move to an optimal location for overseeing the loading and unloading of the truck. This robot is perfect for use at construction operations in a secured area where it can watch over a contingent workforce. Vehicles entering the secured area can be identified by an S5 Automatic License Plate Recognition (ALPR) Robot. This robot is capable of not only recording the license plate numbers of vehicles arriving through the check point but also of patrolling the parking lot inside the restricted area. While patrolling at night, the area security robot can detect people who are not involved in maintenance of the secured critical infrastructure site. Thanks to its ability to navigate without satellite signals, the S5 robot can carry out mobile surveillance inside large premises or in covered areas. These include, for example, warehouses and parking lots for heavy duty vehicles. In addition to security tasks, other models of the S series can be used for moving equipment around an industrial site. The S3 Thermal Image Inspection Robot is capable of carrying out thermal inspection of industrial equipment. Any security robot with the S5 GD (Gas Detection) modification is capable of monitoring the on-site atmosphere by using a portable gas analyzer. The S4 Bird Control Robot is designed to protect equipment and buildings from birds. It is equipped with acoustic generators that scare bird flocks away. Thanks to its autonomous movement capability, this robot can ensure bird control over a large area using medium-range acoustic impact.